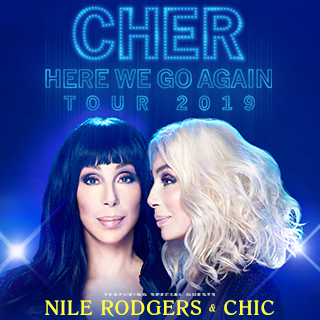 LOS ANGELES, CA (March 29, 2019) – Cher, the legendary multi-award winning entertainer has added 14 major dates to her record-breaking Here We Go Again tour in North America, including a Dec. 17 concert at the AT&T Center in San Antonio. Cher’s Here We Go Again tour, her first across the U.S. in more than five years, has received rave reviews from sold-out crowds at every stop since early January. Fans throng to hear Cher’s biggest hits plus songs from her recent Dancing Queen album – a tribute to the music of ABBA.